French Gothic architecture was the result of the emergence in the 12th century of powerful French state centered in the Île-de-France. During the reign of Louis VI of France (1081–1137), Paris was the principal residence of the Kings of France, Reims the place of coronation, and the Abbey of Saint-Denis became their ceremonial burial place. The Abbot of Saint-Denis, Suger, was a counselor of Louis VI and Louis VII, as well as an historian. He oversaw the reconstruction of the ambulatory of Saint-Denis, making it the first and most influential example of Gothic architecture in France. Over the later course of the Capetian dynasty (1180 to 1328), three Kings; Philip Augustus (1180–1223); Louis IX of France (1226–1270) and Philip le Bel (1285–1314) established France as the major economic and political power on the Continent. The period also saw the founding of the University of Paris or Sorbonne. It produced the high Gothic and the Flamboyant Gothic styles, and the construction of some of the most famous cathedrals, including Chartres Cathedral, Reims Cathedral, and Amiens Cathedral. The Gothic style emerged from innovative use of existing technologies, such as the pointed arch and the rib vault. The rib vault was known in the earlier Romanesque period, but it was not widely or effectively used until the Gothic period. The crossed ribs of the vault carried the weight outwards and downwards, to clusters of supporting pillars and columns. The earlier rib vaults, used at Sens Cathedral and Notre-Dame Cathedral, had six compartments bordered by ribs and the crossing arch, which transferred the weight to alternating columns and pillars. A new innovation appeared during the High Gothic: the four-part rib vault, which was used in Chartres Cathedral, Amiens Cathedral and Reims Cathedral. The ribs of this vault distributed the weight more equally to the four supporting pillars below, and established a closer connection between the nave and the lower portions of the church walls, and between the arcades below and the windows above. This allowed for greater height and thinner walls, and contributed to the strong impression of verticality given by the newer Cathedrals. The second major innovation of the Gothic style was the flying buttress, which was first used at Notre Dame Cathedral. This transferred the thrust of the weight of the roof outside the walls, where it was countered by the weight of the buttress. Heavy stone pinnacles were added to the top of the buttresses, to precisely counterbalance the thrust from inside the walls. The buttress allowed a significant reduction in the thickness of the cathedral walls, and permitted the use of larger windows in the interior of the church. 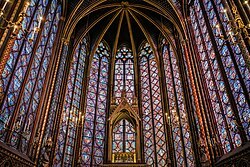 In churches such as Sainte Chapelle, thanks to buttresses, the walls were made almost entirely of stained glass. The development of rib-vaults and buttresses brought gradual changes to the interior structure of cathedrals. Early Gothic cathedrals had the walls of the nave built in four levels, a gallery with columns on the ground level; then the tribune, a gallery with windows; then the triforium, a row of smaller windows, and finally the high windows. just below the vaults. During the high Gothic period, with the development of the four part rib vault and the flying buttress, the tribune was eliminated at Chartres and other new cathedrals, allowing taller windows and arcades. By the 15th century, at Rouen Cathedral, the triforium also disappeared, and the walls between the traverses were filled with high windows. Another innovative feature of the French Gothic cathedral was the design of the portal or entry, which by long Christian tradition faced west. The Basilica of St Denis had a triple portal, decorated with columns in the form of statues of apostles and saints around the doorways, and biblical scenes crowded with statuary over the doorways. This triple portal was adopted by all the major cathedrals. A tympanum over the portal, crowded with sculptural figures illustrating a biblical story became a feature of Gothic cathedrals. Following the example of Amiens, the tympanum over the central portal traditionally depicted the Last Judgement, the right portal showed the coronation of the Virgin Mary, and the left portal showed the lives of saints who were important in the diocese. Large stained glass windows and rose windows were another defining feature of the Gothic style. Some Gothic windows, like those at Chartres, were cut into the stone walls. Other windows, such as those in the chapels of Notre-Dame and Reims, were in stone frames installed into the walls. The most common form was an oculus, a small round window with two lancets, or windows with pointed arches, just below it. 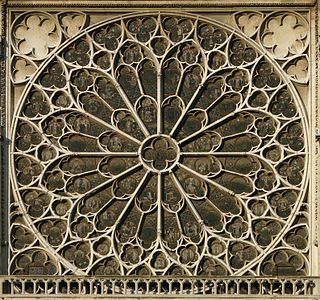 The Rose window was the most famous type of the Gothic style. They were plead in the transepts and the portals to provide light to the nave. The largest rose windows were ten meters in diameter. They had a framework of stone armatures often in an ornate floral pattern, to help them resist the wind. Gothic windows were in a stone frame separate from the wall, not cut into the wall. The early windows were made of pieces of tinted glass, touched up with grisaille painting, and held in place by pieces of lead that outlined the figures. As the windows grew larger, more intense colors were used. After 1260, the colors became lighter, and the combination of grisaille and pale shades of yellow became more common. Chartres Cathedral and Le Mans Cathedral have some of the finest surviving original windows. Because of the lengthy period of construction of Gothic Cathedrals, very few were built in a single style. Most, like Notre Dame, have a combination of features constructed in several different periods, as well as features constructed after the Gothic age. The birthplace of the new style was the Basilica of Saint-Denis in the Île-de-France, not far north of Paris, where in 1137 The Abbé Suger began the reconstruction of the Carolingian-era abbey church. He began building a new structure with two towers to the west of the original church, and then from 1140 to 1144 began to reconstruct the old church. Most of his modifications were traditional, but he made one remarkable innovation; he decided to create a new choir at the east end of the building, eliminating the traditional supporting walls of the old chapels, giving the interior a striking appearance of openness and greater height. To achieve his aims, Suger's masons drew on the several new elements which evolved or had been introduced to Romanesque architecture: the pointed arch; the ribbed vault; the ambulatory with radiating chapels; and the columns wrapped in the ribs which supported the vaults. The builders constructed the walls of the church in four levels; the arcades, whose two rows of columns received the ribs of the ceiling vaults; the tribune above it, a gallery which concealed the massive contreforts or buttresses which pressed against the walls; the triforium, another, narrower gallery; and, just below the ceiling, the claire-voie or clerestorey, where the windows were located. All of these features had existed in the Romanesque period, but it was the first time had all been combined and the result differed dramatically from the previous Romanesque architecture. Another innovation introduced by Suger was the use of columns in the form of statues of saints to decorate the portal of the church, adding a new element of verticality to the facade. This idea too was copied in new cathedrals. The new style quickly became known to the builders of new cathedrals, notably Sens Cathedral, the first Gothic Cathedral (begun 1135); Senlis Cathedral (1160), and the most prominent of all, Notre Dame Cathedral in Paris (begun 1160). Their builders abandoned the traditional plans and introduced the new Gothic elements. The builders of Notre Dame went further by introducing the flying buttress, heavy columns of support outside the walls connected by arches to the walls, which received and counterbalanced the thrust from the rib vaults of the roof. This allowed the builders to construct higher walls and larger windows. 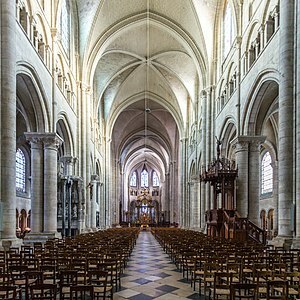 From the end of the 12th century until the middle of the 13th century, the Gothic style spread from the cathedrals in Île-de-France to appear in other cities of northern France, notably Chartres Cathedral (begun 1200); Bourges Cathedral (1195 to 1230), Reims Cathedral (1211–1275), and Amiens Cathedral (begun 1250); The characteristic Gothic elements were refined to make the new cathedrals taller, wider, and more full of light. At Chartres, the use of the flying buttresses allowed the elimination of the tribune level, which allowed much higher arcades and nave, and larger windows. The pillars were made of a central column surrounded by four more slender columns, which reached up to support the arches of the vaulted ceiling. The rib vault changed from six to four ribs, simpler and stronger. The flying buttresses at Amiens and Chartes were strengthened by with an additional arch and with a supporting arcade, allowing even higher and walls and more windows. At Reims, the buttresses were given greater weight and strength by the addition of heavy stone pinacles on top. These were often decorated with statues of angels, and became an important decorative element of the High Gothic style. Another practical and decorative element, the gargoyle, appeared; it was an ornamental rain spout which channeled the water from the roof away from the building. At Amiens, the windows of the nave were made larger, and an additional row of clear glass windows (the claire-voie) flooded the interior with light. The new structural technologies allowed the enlargement of the transepts and the choirs at the east end of the cathedrals, creating the space for a ring of well-lit chapels. The next period of French gothic architecture, from the second half of the 13th century until the 1370s, was termed Rayonnant ("Radiant"), describing the tendency toward the use of more and more stained glass and less masonry in the design of the structure, until the walls seemed entirely made of glass. The most celebrated example was the chapel of Sainte-Chapelle, attached to the royal residence on the Palais de la Cité. An elaborate system of exterior columns and arches reduced the walls of the upper chapel to a thin framework for the enormous windows. The weight of each of the masonry gables above the archivolt of the windows also helped the walls to resist the thrust and to distribute the weight. Another landmark of the Rayonnant Gothic are the two rose windows on the north and south of the transept of Notre Dame Cathedral, whereas earlier rose windows, like those of Amiens Cathedral, were framed by stone and occupied only a portion of the wall, these two windows, with a delicate lacelike framework, occupied the entire space between the pillars. The rose window Sainte-Chapelle de Vincennes. The sinuous lines of the window frame gave the style the name "Flamboyant". The Flamboyant Gothic style appeared in the second half of the 14th century. Its characteristic features were more exuberant decoration, as the nobles and wealthy citizens of mostly northern French cities competed to build more and more elaborate churches and cathedrals. It took its name from the sinuous, flame-like designs which ornamented windows. Other new features included the arc en accolade, a window decorated with an arch, stone pinnacles and floral sculpture. It also featured an increase in the number of nervures, or ribs, that supported and decorated each vault of the ceiling, both for greater support and decorative effect. Notable examples of Flamboyant Gothic include the western facade of Rouen Cathedral and Sainte-Chapelle de Vincennes in Paris, both built in the 1370s; and the Choir of Mont Saint Michel Abbey (about 1448). The most famous examples of Gothic architecture are found in the Île-de-France and Champagne, but other French regions created their own original versions of the style. The Angevin Gothic style in the province of Anjou features a vaults with elegant decorative ribs, as well as very ornate columns. The style is found in the interior of Angers Cathedral (1032–1523), though many of the Gothic elements of the facade were replaced with Renaissance elements and towers. A very fine example of Angevin Gothic is found in the medieval Saint Jean Hospital in Angers, which now contains the Musée Jean-Lurçat, a museum of contemporary tapestries. Poitiers Cathedral in the historic province of Maine also features a distinctive regional Gothic style. It was begun in 1162 under King Henry II of England and Eleanor of Aquitaine. Its distinctive features, like those of Angevin Gothic, include convex vaults with ribs in decorative designs. Burgundy also had its own version of Gothic, found in Nevers Cathedral (1211–1331), Dijon Cathedral (1280–1325), and Chalon Cathedral (1220–1522). The Burgundian Gothic tended to be more sober and monumental than the more ornate northern style, and often included elements of earlier romanesque churches on the same site. The south of France had its own distinct variation of the Gothic style : the Southern French Gothic. A prominent example is Albi Cathedral in the Tarn Department, built between 1282 and 1480. It was originally constructed as a fortress, then transformed into a church. Due to a lack of suitable stone, it was constructed almost entirely of brick, and is one of the largest brick buildings in the world. In the Jacobins church of Toulouse, the grafting of a single apse of polygonal plan on a church with two vessels gave birth to a starry vault whose complex organization anticipated more than a century on the flamboyant Gothic. Tradition refers to this masterpiece as "palm tree", because the veins gush out of the smooth shaft of the column like palm trees. In the 15th century, following the late Gothic or flamboyant period, some elements of Gothic decoration borrowed from cathedrals began to appear in civil architecture, particularly in the region of Flanders in northern France, and in Paris. 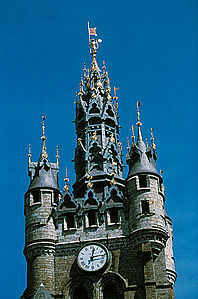 The Hôtel de Ville of Compiègne has an imposing gothic bell tower, featuring a spire surrounded by smaller towers, and its windows are decorated with ornate accolades or ornamental arches. Similarly flamboyant town halls were found in Arras, Douai, and Saint-Quentin, Aisne, and across the border in Belgium in Brussels and Bruges. Unfortunately many of the finest buildings were destroyed during World War I, due to their proximity to the front lines. Gothic features also appeared in the elaborate residences built by the nobility and wealthy bourgeoisie in Paris and other large cities. examples include the Hôtel Cluny (now the Musée de Cluny – Musée national du Moyen Âge in Paris, and particularly the palatial house built by merchant Jacques Cœur in Bourges (1440–50). Another good example in Paris is the Tour Jean-sans-Peur, which features a Gothic watch tower and a flamboyant gothic ceiling. During the Middle Ages Prosperous French cities competed to build the largest cathedral or the highest tower. One of the drawbacks of French Gothic architecture was its immense cost; it required small armies of skilled craftsmen working intently for decades. Due to downturns in the economy, a notable number of French cathedrals were begun but never finished. They also sometimes suffered when the ambitions of the architects exceeded their technical skills. One example was Beauvais Cathedral. Its patrons and architects sought to build the tallest church in the world. with a vaulted choir 48 meters high, taller than its nearby competitor, Amiens Cathedral, at 42 meters. Work began in 1225 but the roof of the vault was too heavy for the walls, and partially collapsed in 1272. They thickened the walls and rebuilt the vault and in 1569 they completed a tower, 72 meters high, which from 1569–1573 made Beauvais Cathedral the tallest structure in the world. However, in 1573, the new tower collapsed, fortunately without any casualties. The church remains today as it was, with the choir, some of the ambulatory, apse, some chapels, but no nave or tower. Beginning in the 1530s, the style of French religious and civil architecture also began to show the influence of the Italian Renaissance. Charles VIII of France and Louis XII of France had both participated in military campaigns in Italy, and had seen the new architecture there. Large numbers of Italian stonemasons had come to Paris to work on the new Pont Notre-Dame (1507–1512) and other construction sites. The Fontaine des Innocents, built by sculptor Jean Goujon to celebrate the entrance of Henry II into Paris in 1549, was the first Renaissance monument in the city. It was soon followed by the new facade of the Cour Carré of the Louvre, also decorated by Jean Goujon. The new Paris Hotel de Ville (1533–1568) was also constructed in an Italianate rather than Gothic style. Most important of all, the new Tuileries Palace by Philippe Delorme, built for Catherine de' Medici, begun in 1564, was inspired by Italian palaces. Religious buildings were slower to change. The Church of the Carmes-Deschaussé (1613–1620) on rue Vaugirard in Paris, and especially the church of St-Gervais-et-St-Protais by Salomon de Brosse (1615–21) with a facade based on the superposition of the three orders of classical architecture, represented the new model. However, the Gothic style remained prominent in new churches. The Church of Saint Eustache in Paris, (1532–1640) which rivaled Notre-Dame in size, combined a gothic plan with renaissance decoration. In the course of the 17th century, the French classical style of François Mansart began to dominate; then, under Louis XIV, the grand French classical style, practiced by Jules Hardouin-Mansart, Louis Le Vau, and Claude Perrault, took center stage. Landmarks of the Gothic style, such as Notre-Dame, were modified with new interiors designed in the new style. Following the new fashion of his patron, Louis XIV, the poet Molière ridiculed the Gothic style in a 1669 poem: "...the insipid taste of Gothic ornamentation, these odious monstrosities of an ignorant age, produced by the torrents of barbarism...". During the French Revolution, Gothic churches were symbols of the old regime and became targets for the Revolutionaries; the cathedrals were nationalized, and stripped of ornament and valuables. The statues of the Biblical figures on the facade of Notre-Dame were beheaded, under the false belief they were statues of the French Kings. Under Napoleon Bonaparte, the cathedrals were returned to the church, but were left in a lamentable state of repair. Castles were surrounded by deep moat, spanned by a single drawbridge. The entrance was also protected by a grill of iron which could be opened and closed. The walls at the bottom were often sloping, and protected with earthen barriers, to One good surviving example is the Château de Dourdan in the Seine-et-Marne department, near Nemours. After the end of the Hundred Years War (1337-1453), with improvements in artillery, the castles lost most of their military importance. They remained as symbols of the rank of their noble occupants; the narrowing openings in the walls were often widened into the windows of bedchambers and ceremonial halls. The tower of the Chateau of Vincennes became a royal residence. In the 19th century, portions of the Gothic walls and towers of the city of Carcasonne were restored, with some modification, by Eugene Viollet-le-Duc. He also rebuilt the Château de Pierrefonds, (1393-1407) an unfinished medieval castle, making it into a neo-Gothic residence for Napoleon III. This project was incomplete when Napoleon III was overthrown in 1870, but can be visited today. Saint-Laurent, Paris by Simon-Claude-Constant Dufeux (1862–65). A large part of the Gothic architectural heritage of France, particularly the churches and monasteries, had been damaged or destroyed during the Revolution. 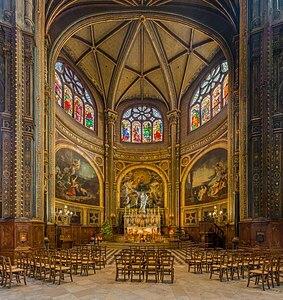 Of the 300 churches in Paris in the 16th century, only 97 still were standing in 1800. The Basilica of St Denis had been stripped of its stained glass and monumental tombs, while the statues on the façade of the cathedral of Notre-Dame de Paris had been beheaded and taken down. Throughout the country, churches and monasteries had been demolished or turned into barns, cafes, schools, or prisons. The first effort to catalog the remaining monuments was made in 1816 by Alexandre de Laborde, who wrote the first list of "Monuments of France". In 1831 interest in Gothic architecture grew even greater following the huge popular success of the romantic novel Notre-Dame de Paris by Victor Hugo. In 1832 Hugo wrote an article for the Revue des deux Mondes which declared war against the "massacre of ancient stones" and the "demolishers" of France's past. Louis Philippe declared that restoration of churches and other monuments would be a priority of his regime. In October 1830, the position of Inspector of Historical Monuments had been created by the Interior Minister, François Guizot, a professor of history at the Sorbonne. In 1833 Prosper Mérimée became its second Inspector, and by far the most energetic and long-lasting. He held the position for twenty-seven years. Under Louis Philippe,French Gothic architecture was officially recognized as a treasure of French culture. Under Mérimée's direction, the first efforts to restore major Gothic monuments began. In 1835 The church of Saint Séverin in Paris was among first to undergo restoration, followed in 1836 by Sainte-Chapelle, which had been turned into a storage house for government archives after the Revolution, The restoration of Saint-Chapelle as led by Félix Duban with Jean-Baptiste Antoine Lassus and a young Eugène Viollet-le-Duc. In 1843 Lassus and Viollet-le-Duc won the competition for restoration of Notre-Dame de Paris  Over the rest of the 19th century, all of the major Gothic cathedrals of France underwent extensive restoration. French Gothic architecture also experienced a modest revival, largely confined to new churches. Neo-Gothic churches built in Paris included Sainte-Clothilde by Theodore Ballu (1841–57); and Saint-Laurent, Paris by Simon-Claude-Constant Dufeux (1862–65). Jean=Baptiste Lassus became the most prolific neo-Gothic architect in France, constructing Saint-Nicolas de Nantes (1840), Sacré-Coeur de Moulins (1849), Saint-Pierre de Dijon (1850), Saint-Jean-Baptiste de Belleville (1853) and the Église de Cusset (1855). The Saint-Eugene-Sainte-Cécile in Paris by Louis-Auguste Boileau and Adrien-Louis Lasson (1854–55) was the most innovative example of neo-Gothic; it combined a traditional Gothic design with a modern iron framework. Jules Verne was married in the church in 1857. The Gothic cathedral was a liber pauperum, literally a "book for the poor", covered with sculpture illustrating biblical stories, for the vast majority of parishioners who were illiterate. These largely illustrated stories from the Bible, but also included stories and figures from mythology and more complicated symbols taken from medieval philosophical and scientific teachings such as alchemy. The exteriors of Cathedrals and other Gothic churches were decorated with sculptures of a variety of fabulous and frightening grotesques or monsters. These included the gargoyle, the chimera, the dragon, the tarasque, and others, taken largely from legend and mythology. They were part of the visual message for the illiterate worshipers, symbols of the evil and danger that threatened those who did not follow the teachings of the church. The Gargoyle also had a more practical purpose. They were the rain spouts of the Cathedral; rainwater ran from the roof into lead gutters, then down channels on the flying buttresses to the mouths of the gargoyles. 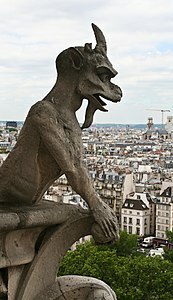 The longer the gargoyle, the farther the water was projected from the walls, protecting the walls and windows from water damage. Multiple numbers were used to distribute the water as widely as possible. Amid all the religious figures, some of the sculptural decoration was devoted to illustrating medieval science and philosophy. The porch of Notre Dame Cathedral in Paris and of Amiens Cathedral are decorated with similar small carved figures holding circular plaques with symbols of transformation taken from alchemy. 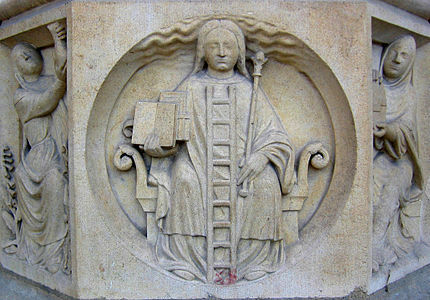 The central pillar of the central door of Notre Dame features a statue of a woman on a throne holding a scepter in her left hand, and in her right hand, two books, one open (symbol of public knowledge), and the other closed (esoteric knowledge), along with a ladder with seven steps, symbolizing the seven steps alchemists followed in their scientific quest of trying to transform ordinary metal into gold. Another common feature of Gothic cathedrals was a design of a labyrinth, usually found in stone on the floor in a central part of the Cathedral. Inapired by the labyrinth in Greek legend constructed by King Minos as the home of the Minotaur, In Cathedrals, they were known as the "Path of Jerusalem" and symbolized the difficult and often roundabout path that a Christian sometimes had to follow in life to reach the gates of Paradise and salvation. Large labyrinths were originally found in Auxerre Cathedral, Sens Cathedral, Reims Cathedral, and Arras Cathedral, but these removed during various renovations in the 18th century. The best surviving examples are in Chartres Cathedral, in its original form, and in Amiens Cathedral, which was reconstructed in 1894. ^ Philippe Bonnet-Laborderie, La Cathédrale de Beauvais: histoire et architecture, La Mie-au-Roy, G.E.M.O.B., 1978. ^ Darcos 1998, pp. 156–159. Wikimedia Commons has media related to Gothic architecture in France.